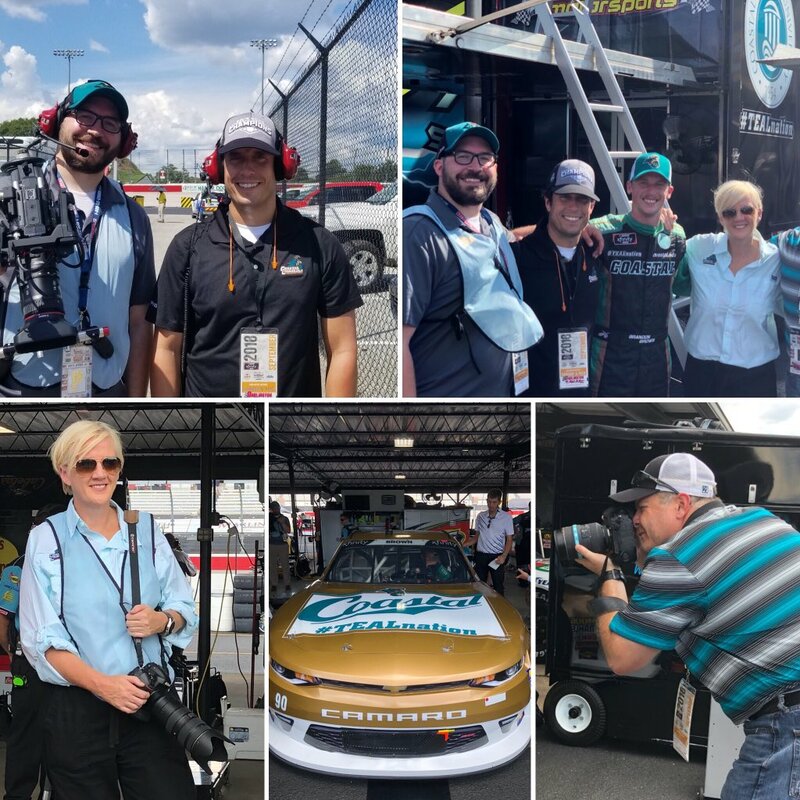 Fun at Darlington – At the end of last week, I had the opportunity to go to Darlington Raceway to cover Brandon Brown, our CCU student who is also a NASCAR Xfinity driver. Just that alone was pretty cool but making the trip even better was that I got to go with some of my favorite co-workers. Geoff, one of our video production managers, and Judy, our head photographer, both joined me. Leading the trip and doing whatever he could to help us was Bill, our University Communication vice president. It was extremely hot (think the last day in August in the South inside a concrete stadium) but we sure had fun working together. It was also a pleasure covering Brandon and his team. Side Note: I have now been on the infield at three major racetracks. I had a great time with my University Communication team in Darlington. “We’re Here” – With Tuesday’s blog post centering on an advice column, I felt it was appropriate to extend the theme to today. I recently was reading a “Social Q&A” column and one of the letters was from a woman who was put off by a texting habit of her husband. 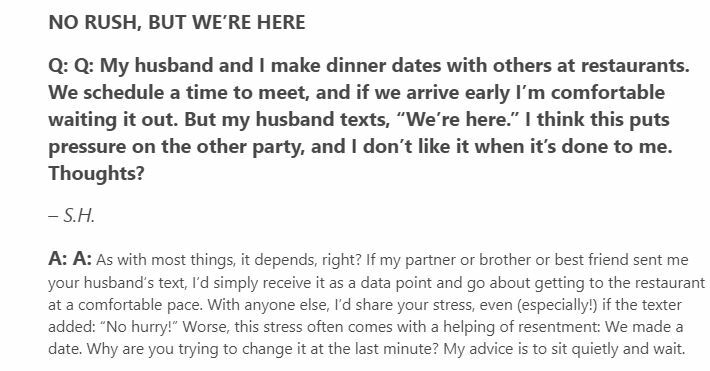 When meeting friends for dinner, the husband will usually send a “we’re here” text to the people they are meeting. The wife explained she feels it is rude and puts pressure on the people they are meeting to arrive at the restaurant. In my opinion, I don’t think it is rude. Rather, I think the text conveys a message more along the lines of “look for us when you get here” as opposed to “we are looking at our watches and waiting for you.” I was convinced even more of this notion when I thought about my own dad sending the “we’re here” text. Yes, it would be something he would do, but it wouldn’t have any ill-intent at all – it would just be a nice gesture to let his friends know that they made it safely and were excited to soon be in their company. This is the question and response to the “We’re Here” controversy. 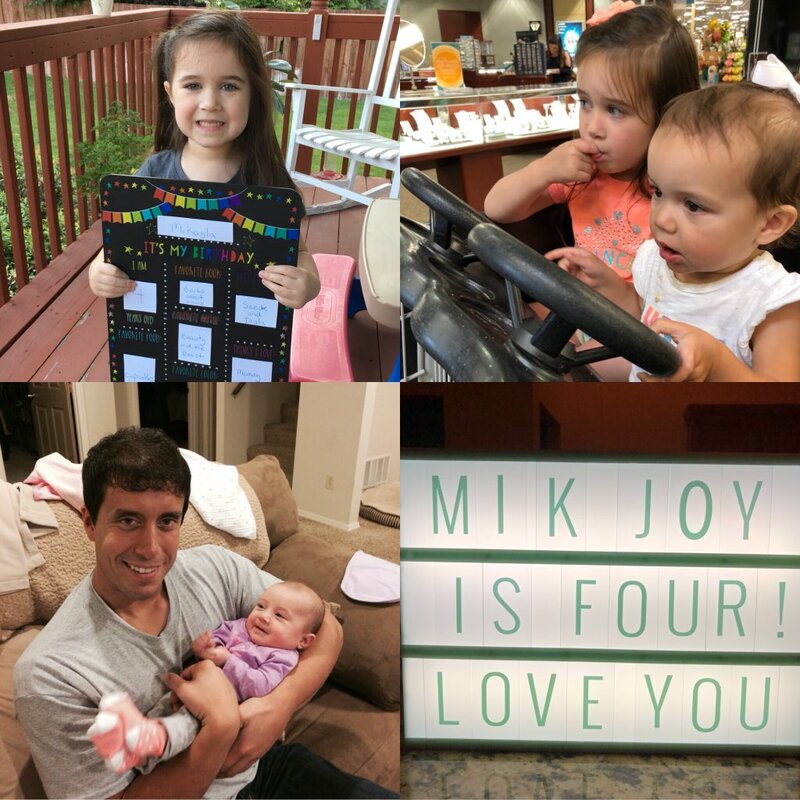 Happy Birthday, Mik – I wanted to wish a happy birthday to one very special little girl. Mikayla, my niece, turned 4 years old yesterday. It blows my mind because it seems like just yesterday I was sitting on my couch in my apartment typing out this blog post about her birth. Time really does fly. Although I don’t get to see her as often as I would like, I still love her very much. I am also so thankful for the special bond that Mik and Sloan have – which was so evident when we were in Spokane this past summer – even if there is an age difference and a major geographic barrier. Mikayla’s birthday was yesterday but she will be the center of attention on Sunday as her parents throw her a birthday bash. Happy birthday to my niece, Mikayla. First Time in the South – Six years ago on this date, I ventured to the true South for the first time in my life (I had been to Florida before). While working for the University of Montana, I traveled to Boone, NC, for a much-anticipated football game between the Grizzlies and Appalachian State. I had so much fun experiencing this unique region of the country for the first time. Little did I know that I would be living in it just a couple years later. The people, food, and sights were unforgettable – but the game result was. The Griz lost to App State on a humid night in Kidd-Brewer Stadium. 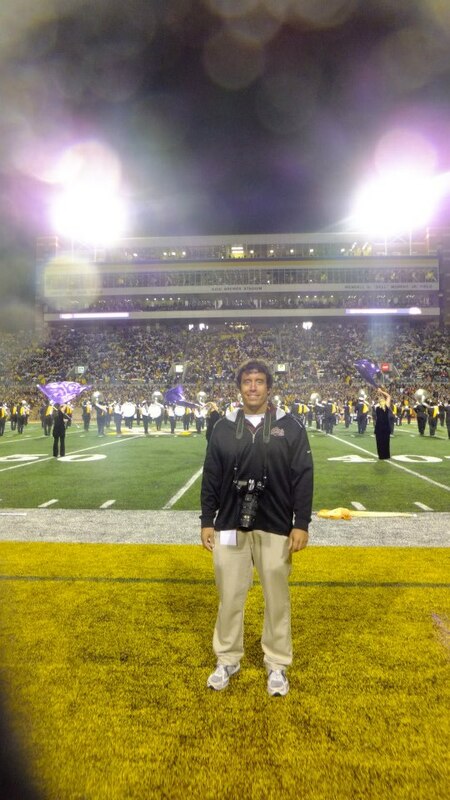 This is me in Kidd Brewer Stadium six years ago. 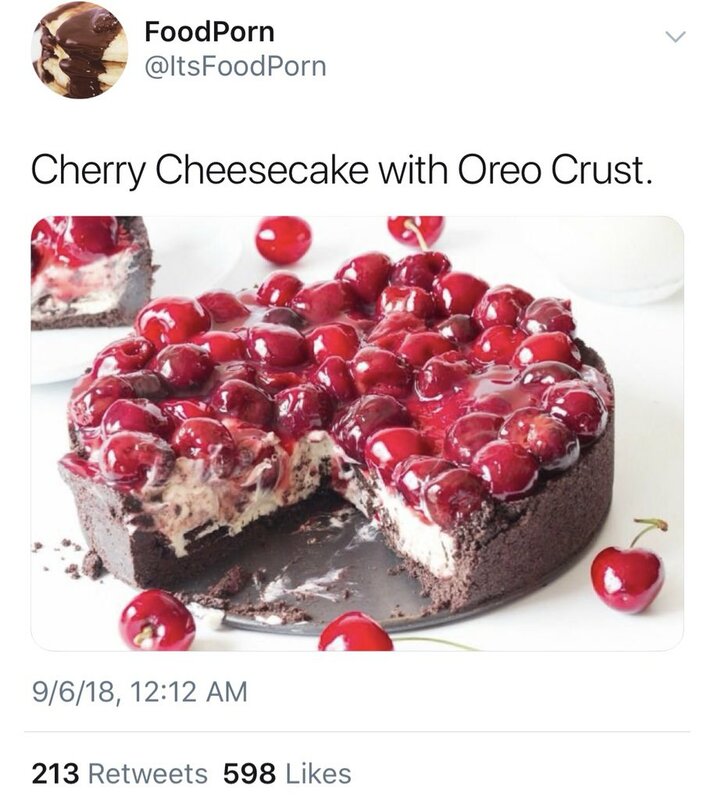 Oreo Cherry Cheesecake – As most of my readers know, every now and then I like to devote one of my Thursday Rundown topics to the @ItsFoodPorn Twitter account. Sometimes it’s for better, sometimes it’s for worse. Today it is for worse. I have a hard time supporting Oreos and cherries mixed together. I like Oreo cheesecake and I can deal with cheery cheesecake, but Oreo/cherry cheesecake is a big no-no for me. What you see below is not something I would want to see on a dessert tray. Am I crazy? No, this is not for me. Thank you again for reading Don’t Blink. I hope your week has not only been short, but sweet, as well. Catch up with you soon. Don’t Blink.